A new generation of compressors with more power in smaller units. 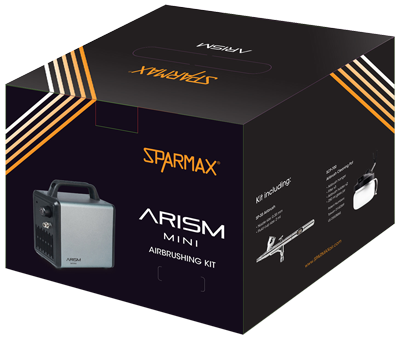 The Sparmax ARISM Mini Kit is ideal for beginners through to professional airbrush users and is suitable for a wide range of applications. Sparmax Cleaning Pot with built in airbrush holder. This Sparmax airbrush is warranted by The Airbrush Company Ltd against manufacturing defects of materials or workmanship for a period of 5 years from the original date of purchase. 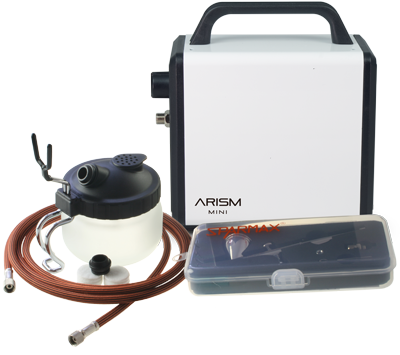 This Sparmax Arism compressor is warranted by The Airbrush Company Ltd for a period of 2 years from the original date of purchase. 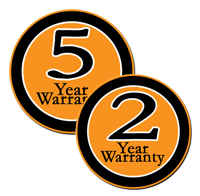 The warranties do not cover fluid needles, nozzles, packing and o-rings, compressor pistons and automatic switches, since these parts need to be replaced occasionally due to normal wear. Check out our Airbase HD Make-up, teamed with our professional airbrush kits. We offer MUA’s the perfect kit delivering fast and flawless results.